IOHK is the leading blockchain research and development company behind top 10 cryptocurrency Cardano. They have also recently announced that it will present its research on Ouroboros Genesis at ACM Conference on Computer and Communication Security. Since the company was founded in 2014 it has pioneered new territory in blockchain research, advancing industry knowledge with the work produced by its global team of cryptographers and researchers. A growing network of academic partnerships supports its research and the Blockchain Technology Laboratory at the University of Edinburgh serves as the global headquarters for its university collaborations. With its twin pillars of research and development, Input-Output aims to shorten the time between academic research and its application in industry, while supporting the education of students who will contribute to the future of the area. All the work Input Output produces is open source and patent-free. The company is incorporated in Hong Kong and has a global presence, with now about 70 workers based around the world, including in Japan; the US, the UK, Russia; Latvia; Ukraine and Argentina. IOHK’s research tackles critical challenges that exist in proof-of-stake protocols and this latest version of Ouroboros, the algorithm powering Cardano, represents a significant milestone on the roadmap of research that began with Ouroboros and was followed by Ouroboros Praos. Today’s guest is Aggelos Kiayias who is the chair in cybersecurity and privacy at the University of Edinburgh. His research interests are in computer security, information security, applied cryptography, and foundations of cryptography with a particular emphasis in blockchain technologies and distributed systems, e-voting and secure multiparty protocols, as well as privacy and identity management. On today’s crypto podcast, I invite you to learn more about IOHK, the leading blockchain research and development company. 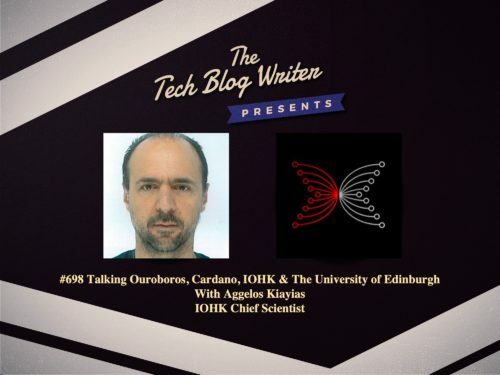 We also discuss Cardano’s Ouroboros Protocol, the future of Cardano in a conversation with Aggelos Kiayias. I am also keen to explore the humanistic approach that Aggelos is famed for and what excites him about the future.